Thursday July 8th 1897 I hurried through with the work the folks all came down from home about nine oclock. We had a good days visit. They did not go home till after supper. Aunt Ellen and the girls spent the afternoon here. It was a very warm day. The men are putting hay in the barn. Friday July 9th 1897 I had extra work to do with the milk and butter to work up this morning and then I gave the house a cleaning up. did mending in afternoon. It has been a fearfully hot day. Saturday July 10th 1897 Will went to town alone today. I finished the ironing and did baking in the forenoon. I sewed in the afternoon, was down to Callies for currants for supper. It blew up cooler in the afternoon. Will said it rained in town. he was over home for dinner and said Ida & Nellie came yesterday. Sunday July 11th 1897 I did up the morning work and read till time to get dinner. I slept most of the afternoon and read and wrote some. A fine day to rest. 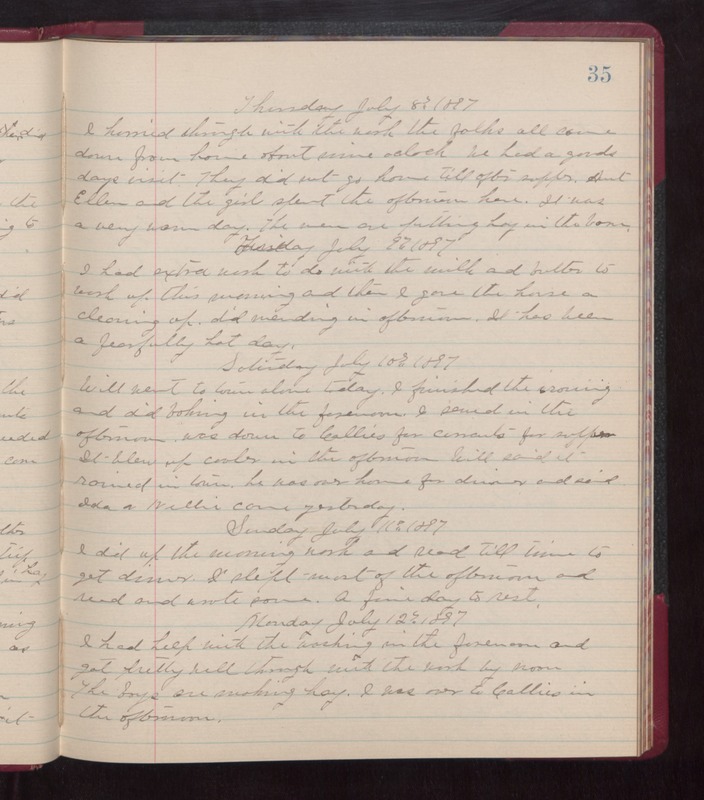 Monday July 12th 1897 I had help with the washing in the forenoon and got pretty well through with the work by noon. The boys are working hay. I was over to Callie's in the afternoon.